Join us this Monday (July 30) to race and/or spectate the final stage of the 2018 Portland Short Track Series presented by Hopworks Urban Brewery! In good tradition, it will be a fun evening, with the top contenders in each category battling it out for the final series points and podium spots (make sure to check the podium contenders in each category!). 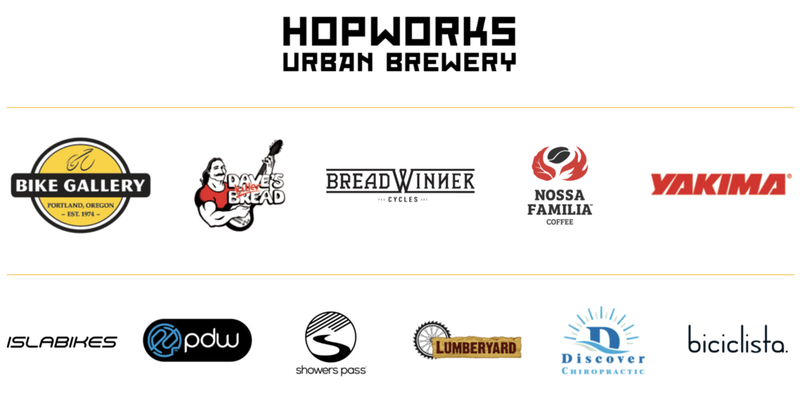 To make the celebration complete, our title sponsor Hopworks Urban Brewery will come out again to sample their most popular organic summer ales (to anyone over 21) and perennial series sponsors Nossa Familia Coffee will make an encore and serve free iced coffee and iced mochas! Camas Bike & Sport, Beermongers, Metropolis Cycle Repair, Half Fast Velo, Dialed Cycling A-Team, Dialed Cycling B-Team, Stumptown Cycling Club, Cyclepath Racing, Breadwinner Cycles, Team Lazy Tarantulas, Rebound/Tireless Velo, Trusty Switchblade, Team O Swift, Planet X & Friends, Les Volontaires, Team Tuite/Finger and Friends, Oregon Bike Shop Racing Team, Fast Fun Nice, Team Nonstop, Hammer Velo Team DNF/DQ, bicycleattorney.com, Green Submarine Records, Team Summer Casual, and Monday Night Leftovers. STILL TIME TO REGISTER YOUR TEAM AND JOIN THE FUN! We still have a few slots left, so if you and your team mates (or assorted friends) still like to get in on the fun, just send an email to kris@portlandracing.com with your team name, the designated team captain, and a tentative list of riders who will race on your team. Note: we will close registration for the team relay at Noon on Sunday and won't accept additional team registrations on Monday! The entry fee for the team relay is $30/team, which you can pay either online through OBRA or on Monday at the pre-reg/info desk. Like every week, we will stage three FREE Short Track Kids Races which will all start and finish near the regular start area under the trees. After the kids races have wrapped up (around 6:10pm), kids will get treated to FREE ice-cooled lemonade and our series sponsor Islabikes will raffle off a kids bike among all kids who raced the series (even if your kid just raced the last night, they have a chance to ride home on a cool, new bike)!